Friends of the Rideau does a lot of looking back, normally into the fascinating history of the Rideau Canal. But in this case, we’re looking back at some of the fascinating history of Friends of the Rideau. As part of some “strategic visioning” by the Board of Directors, your editor has been compiling a list of accomplishments by Friends. Sharing the Water Boats, both big and small, share the waters of the Rideau Canal. 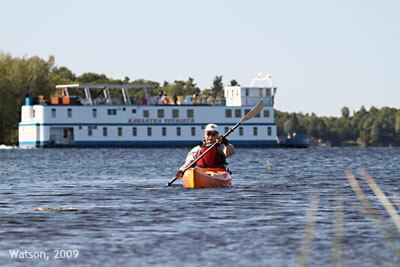 Here we see the biggest, the cruise boat Kawartha Voyageur in the navigation channel on Lower Rideau Lake while one of the smallest, a kayak, heads into “the cut”. On that day we saw three of the Rideau’s cruise boats, the Kawartha Voyageur, the Rideau King and the General Brock III, all plying the waters of Lower Rideau Lake. Our history in a nutshell is that Friends was founded in 1985 as the “Rideau Waterway Co-ordinating Association” (RWCA). In 1989, a wise group of directors adopted the much nicer working title “Friends of the Rideau” for the organization. We were formally incorporated under the RWCA name with an official aka of “Friends of the Rideau” in 1990. One of our main communication vehicles, this newsletter, was first published (Vol.1 No.1) in early 1989. Of note, that means that this year is the 20th anniversary of the newsletter – your current humble editor has been at the helm for the last 12 years. So, a bit of a milestone. The newsletter is sent not only to our members, but also to all Rideau region lake, environmental and heritage associations as well as many politicians, to help keep people informed about the Rideau Canal. There have been several programs initiated by Friends of the Rideau that have seen large positive impacts on the Rideau Canal. In 1989 we partnered with Friends of the Trent-Severn and Nissan Marine to launch a “Watch Your Wake” program. This resulted in signs, brochures, an educational “Watch Your Wake” package and our “Stop WASH” (Stop Washing Away Shoreline Habitat) edu-kit (you can see some of this on our website). The program has since been taken over by Parks Canada. Perhaps the most significant project was initiated in 1992 when we launched an initiative (spearheaded by director Larry Turner) to have the Rideau Canal put on Canada’s tentative list of sites to be nominated for World Heritage Status. A minor hiccup soon discovered was that there was no category for canals in the World Heritage Convention – so Friends partnered with the Canadian Parks Service to set up a meeting of UNESCO technical experts in order to define canals as potential World Heritage sites. That meeting was held at Chaffeys Lock in 1994 and drew up the documentation by which canals could be awarded World Heritage Status (and we know the ending of that story for the Rideau Canal). We entered the publishing business in 1989 with the annual (to about 1993) Rideau Reflections tourist guide. In 1992 we published Larry Turner’s “Rideau Canal Bibliography, 1972-1992” an invaluable resource document for those researching the Rideau. Our history of publishing continued with “Living Near the Water: Environmental Design for Shoreline Properties” in 1995; Ken Watson’s “A History of the Rideau Lockstations” in 2000; re-publishing Robert Legget’s “Rideau Waterway” in 2001; re-publishing Robert Passfield’s “Building the Rideau Canal” in 2003; publishing Ed Bebee’s “Pathfinders: The Guides of the Rideau” in 2004; Ed Bebee’s “Fish Tales” in 2007; publishing Lockmaster Peter Sweeney’s diary as “The Sweeney Diary” in 2008; and several of Parks Canada manuscript reports as digital books on CD in 2009. We also acquire and offer for sale every book we can find about the Rideau Canal – providing the public with easy access to all sorts of interesting (and usually educational) Rideau reading material. We got into the brochure business in 1993 with the Watch Your Wake program. Since then we’ve done such brochures as “How A Lock Works,” “Be Rideau Loon Aware,” “The Depot to Dam Trail,” and “Managing Aquatic Vegetation on the Rideau Canal” (the latter in partnership with Parks Canada). We even did a map once with the creation of the “Cycle Rideau-Lanark” bicycle tour map in 1993. We got into the art-print business with the creation of the print “The Rideau King at Jones Falls” in 1991 (we still have a few of those left). Our website, launched in 1997, brings information about Friends and the Rideau Canal to a world audience. We’ve done several other web initiatives, including creating the very successful www.rideau175.org website in partnership with Parks Canada, which provided the public with an up to date list of Rideau 175 events. Our main fundraiser for the organization is retail sales. We ran our office at 1 Jasper as the “Lockmaster’s House Boutique” from 1989 to about 1993. In 1995 we opened The Depot in Merrickville as a Rideau interpretive centre and retail outlet. It has been going strong ever since. We opened on-line sales via our website in 1998. Profits from our sales go into our general programs, but in 2007, we decided to take all (100%) of the revenues from our sales of Rideau 175 merchandise and use it to create the Rideau Legacy Fund. That special fund has since been used to publish “The Sweeney Diary”, re-publish “Fish Tales” and print all of our Books on CD (digitized Rideau manuscript reports). We did a few of our own events including Dinking-on-the-Rideau from 1988 to 1991. This was followed by the Rideau Canoe Classic which we organized and hosted from 1995 to 1998 and we’ve actively participated in Merrickville’s Canalfest since the Depot opened in 1995. And, of course, we attended many events over the years; boat shows, Rideau events and festivals. These days you’ll find a Friends of the Rideau booth manned by smiling volunteers at many Rideau events. Directors from Friends participate in many meetings every year. Over the years these have included the World Heritage Advisory Committee, Canadian Heritage River Committee, Rideau Canal Management Plan meetings, Rideau Canal Advisory Committee, Rideau Corridor Tourism Initiative, Rideau 175 Organizing Committee, Rideau Heritage Network and the Rideau Corridor Landscape Strategy Steering Committee. While much of this is behind the scenes work, it takes true dedication from several of our board members to invest the time and effort required to actively participate in these. Like any other organization, we also worked on several projects that never saw the light of day (i.e. Kids@Parks), but as you can see from the above, our list of tangible successes is very long and continues to grow. This work was done on a volunteer basis by dedicated people offering their time and skills to help achieve the goals of the organization (which are to promote and protect the heritage and charm of the Rideau Canal). When the Canadian Parks Partnership used to compile listings of yearly volunteer hours for “Friends of” organizations, Friends of the Rideau was always near the top. That tradition of volunteer effort on behalf of the Rideau Canal continues to this day. Our 2009 AGM was held on May 9, 2009 at the Legion Hall in Merrickville. We were very pleased to have a special guest, Heather Thomson of Parks Canada, the heritage planner for the Rideau Canal. Chair, Ed Bebee, reviewed the year for Friends. A significant accomplishment this year was the creation and publication of “The Sweeney Diary: The 1839-1850 Journal of Rideau Lockmaster Peter Sweeney”, a major effort by Friends to make this very interesting piece of Rideau history available to the public. Ed noted that Friends was also out and about at various events along the Rideau including the Newboro Boat Show, the Rideau Canal Festival in Ottawa and the Classic Boat Show at Long Island. Our retail outlet and interpretive centre in Merrickville, the Depot, had a reasonable year despite the economy. Ed summarized our new project to make many of the Parks Canada Rideau research reports available to the general public as books on CD. To date, three reports have been digitized and produced as digital books and several more are in the works. Ed noted that several directors serve on various Rideau committees and most recently, several attended a forum dealing with the Rideau Corridor Landscape Strategy. Following the financial report and election of directors, Ed introduced our guest speaker, Heather Thomson, who gave an extremely interesting talk on the Rideau Corridor Landscape Strategy. She pointed out that the Rideau Corridor is over 200 km in length and that cooperation is essential between all levels of government to ensure that the Corridor is protected and preserved so that the World Heritage Site status is also protected. Heather pointed out that there are, and will be, development issues and challenges and asked how municipalities along the Rideau will control and have sustainable development and yet provide clarity, certainty and transparency in the planning processes to decision makers, property owners and other stakeholders. Parks Canada hopes that the Landscape Strategy will serve as a foundation for co-operation between property owners, First Nations, municipal, provincial and federal levels of government. After Heather’s talk (which was followed by the three C’s: coffee, cake and cookies) the meeting was moved to an outdoor venue, a guided tour by FoR director Ken Watson, looking at the pre- and post-canal landscapes of Merrickville. The tour concluded at remains of the stone dam upstream from the town (the end point of the Depot to Dam Trail) just before the rain showers started. Directors: Ed Bebee, David Brett, Jeanne Brett, Mark King, Josephine MacFadden, Brian Osborne and Ken Watson. At its meeting of July 9, the Board of Directors of the Friends of the Rideau elected me as the Chair for 2009-2010. I'm pleased to be given this responsibility, though I have to admit that I am also a tad worried as I am taking over from Ed Bebee who has served so illustriously as Chair. Ed has graciously agreed to remain on the Board and to continue to provide advice and guidance. The year ahead presents some interesting opportunities for Friends of the Rideau, not the least of which is the chance to refine and reshape our relationship with Parks Canada in light of the higher profile the Rideau Waterway is receiving now that it is a World Heritage Site. Elsewhere in this newsletter you will read about the Rideau Corridor Landscape Strategy and the discussion on the consensus needed for sustainable management of the Waterway. This is a discussion which Friends is part of and which merits our continued involvement. As well, given the interest in our Books on CD/Resources for the Rideau initiative, launched last year and overseen by Ken Watson, it is clear that there is considerable interest in Friends' activities to support increased knowledge about the history of the Rideau. Judging by the number of visitors to our Depot facility in Merrickville, that outlet continues to provide valuable service to people coming to that site and - through information provided there - to other points of interest along the Waterway. So, for an organization run by volunteers, we are making an impact and will continue to do so. I hope I will have the opportunity to meet many members of Friends over the coming year at the various events in which we take part. As well, I welcome comments, feedback and suggestions via email at info@rideaufriends.com. Offers to help with any of our activities are always very welcome. As the season on the Rideau Canal closes for 2009, lets all enjoy the superb autumn colours and celebrations along the Waterway, and plan for a great year in 2010. Friends of the Rideau organized a travelling road show this summer, visiting a number of events along the Rideau Canal and meeting old and new supporters. We began the season at the Newboro Boat Show, followed by the Rideau Canal Festival in Ottawa, then the Manotick Classic Boat Club show at Long Island Locks and ended with the Rideau Ferry Regatta. At Newboro and Long Island we had the support of both the local Parks Canada lockstation teams and the very helpful usual suspects at the Canal HQ in Smiths Falls (thank you Juan Sanchez and Cheryl Gulseth.) At Rideau Ferry we enjoyed working with the organizing committee for the Regatta, which celebrated its 100th anniversary in 2009. The Rideau Canal Festival, a combination heritage and environment event, was closed down by heavy rain on the Sunday of the August Civic Holiday weekend, but on the Saturday and the Monday we met many people, had the chance to talk about the Rideau Waterway with them and also got to know our tent-mates from Parks Canada and the Rideau Heritage Route Tourism Association. All these events enable Friends of the Rideau to spread our messages, generate revenue from selling books and other items, and let folks know how important the Rideau Waterway is in our history and for our environment. We intend to organize the road show again in 2010 and would welcome your participation as volunteers. At the very least we hope you would be able to visit the various sites and say hello to the Friends executive and other members! After some initial panic regarding staffing (see the article “Almost Grantless”) – we managed to open the Depot on time and keep it operating this summer. A big round of thanks go to Cheryl Gulseth and Dave Brett for pulling this all together. Our student this year was Kyla Mouré who did a terrific job. Special thanks go to Juan Sanchez of Parks Canada for his help and for the loan of 2 of his students, Sarah Byford and Alexander Smith who were of immense help. Special thanks too, to Gord Giffin and Irv Mazurkiewicz of Parks Canada for making arrangements that allowed Cheryl to devote some of her working time to help us out. Providing Cheryl with work flexibility was a huge help to us. The Depot continues to operate on weekends this fall with some extra volunteer help, including Ed and Lucy Bebee and Hunter McGill. Our new line of clothing was very popular this year (lower price/good quality) and we plan to expand our own product line next year (i.e. postcards, fridge magnets, water bottles, pins, keychains, etc.) in order to help boost retail sales (and promote the Rideau Canal). While the economic recession and associated job losses have not been fun for anyone, we looked at it as a possible opportunity this spring. Surely this would make it easier for us to get HRSDC (federal government) staffing grants, providing a few people with gainful employment in these tough economic times. Accordingly we applied for funding to help cover three students and an office manager position. Four of our directors worked diligently (many many hours) on this – filling out long application forms, meeting with government staff and in general doing everything we could to ensure grant success. In the end we received only a small grant to partially cover one student. One application (Ontario government) was rejected because the job involved had been previously filled by a volunteer and thus didn’t qualify as a grant position. We do however wish to give a big thank-you to the Rideau Canal Office of Parks Canada. While they do not provide us with any direct financial support, they came to the rescue in the form of in-kind support, in particular allowing us to “borrow” some of the time of two of their summer students in Merrickville to help out with The Depot. This provided a nice synergy since in addition to retail sales, the Depot is a Rideau interpretation centre, which directly meets Parks Canada’s goals – so it was a win-win situation. Without this help it is unlikely we could have operated the Depot as we did this summer. Unfortunately, while there has been lots of activity on this topic, we don’t have much progress to report on since the last newsletter. A steering committee tasked with setting the terms of a request for proposal (RFP) to initiate a study regarding the visual values of the Rideau Canal was set up by Parks Canada. It consisted of 17 representatives ranging from municipalities (Doug Struthers, the Mayor of Merrickville, was appointed Chair) to NGOs such as Friends of the Rideau. After two meetings that made good progress towards setting the terms of the study, politics, in the form of a request for more municipal involvement at this stage of the process, intervened. Accordingly, the last meeting, held in early September, was exclusively on setting up a new governance model. Bottom line is that no study has been initiated and very likely won’t be this year. We don’t know if the new governance means that it will be back to square one in terms of setting up a study. We also don’t know what our role, as a group providing public input, will be in the new process. We can only hope that at some point progress will be made towards meeting the UNESCO requirement to define and protect the visual values of the Rideau Canal. 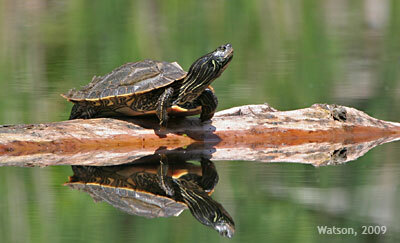 Our Wildlife Friends The quality of the landscapes that border the Rideau Canal impact not only us, but our various wildlife friends, including turtles, such as the Map Turtle pictured here. The numbers (vessel passages through the locks) to the end of August 2009 are in and they show an increase of 5.0% compared to 2008 (65,469 vessel passages in 2009 compared to 62,343 in 2008). The origin of the boaters in 2009 was 62.7% from Ontario, 26.4% from Quebec and 10.4% from the U.S. This represents an increase in the percentage of Quebec boaters over 2008 (when it was 22.7%). The decline was in Ontario boaters (U.S. boaters stayed about the same). The busiest locks in terms of vessel passages were, as always, Narrows (5,469), Newboro (5,008), Chaffeys (4,354) and Davis (4,116). The least busy were Beveridges (1,053) and Harwells (1,201). This was a timely release for us, coinciding with the 175th anniversary of the Tay Canal. The tedious job of scanning and proofing this document was done by volunteer Bob Sears of the Canadian Canal Society. 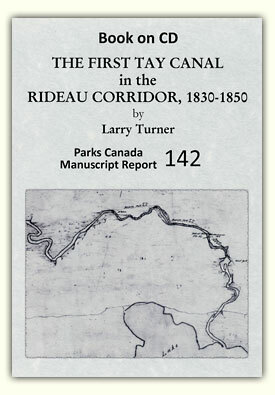 As someone interested in the canals of Canada, Bob was very aware of the upcoming 175th anniversary of the Tay Canal and volunteered to take Larry’s report on the First Tay (opened in 1834) and digitize it for us. Bob did a great job, making the work of creating the final digital book much easier. So, a big thank-you to Bob Sears for a job well done! Our thanks too go to Ellen Manchee of Parks Canada who was able to source the original “print-ready” document and very kindly provide it to Ken Watson so that the images could be scanned in high resolution. The final digital document greatly benefitted from having very high quality scans of all the figures. As with all of Larry Turner’s reports, this 183 page report is very thorough. It deals with the first Tay Canal, constructed by the Tay Navigation Company between 1831 and 1834. Five small scale and cheaply constructed locks were erected on the Tay River between Perth and Port Elmsley before the river opened into Lower Rideau Lake. Circumstances surrounding the planning, financing, building and use of the Tay Canal are detailed in this report. The building of the first Tay Canal also emphasized the extensive nature of the mercantile hinterland of Montreal. While the Tay was a remarkably cheap and limited waterway it helped consolidate commercial trade within the area. However, the limited resources of the Tay watershed and a receding frontier left Perth Landing a town and country trade neither conducive to expansion nor sufficient to sustain a declining branch canal. The fortunes of the Tay Canal rose and fell with the fortunes of Perth. This study was a concentrated effort to compile information on the Tay Canal and Tay Navigation Company and to determine its role within the local as well as the wider framework of commercial pursuits in the period between 1830 and 1850. Included are 32 illustrations (maps, diagrams and photos). As a bonus in this digital edition, the first detailed article about the Tay Canal: “The First Tay Canal, An Abortive Upper Canada Transportation Enterprise of a Century Ago” by H.R. Morgan, 1933, has also been included. The scanning, proofing and formatting of this document was done by FoR volunteer Helen E. Parson. I think Helen was a bit taken aback when a photocopy of the 431 page document arrived in her mailbox (with a thump). Helen did a wonderful job at scanning, proofing and formatting the document, making the job of creating the final digital book a breeze. In fact some of the formatting initiatives Helen developed with this document have now been applied to our other books on CD projects. A great job and so a big thank-you to Helen! And, our thanks go again to Ellen Manchee of Parks Canada who was able to source the original “print-ready” document and provide it to Ken Watson for high resolution scanning of the images. Larry’s report is an exhaustive look at the beginning of recreational boating on the Rideau. His report is divided into five parts. The first part looks at the development of recreational boating in Ontario in general and on the Rideau Waterway in particular. 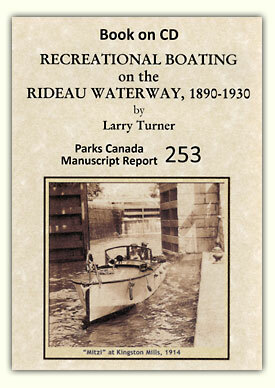 Part two identifies the variety of recreational boats on the Rideau and traces their development between 1890 and 1930. Part three explores recreational boaters, their activities, their environment and the places or sites influenced by their pursuit of boating. Part four examines the evolution of the steamer excursion as a popular activity in pleasure boating and the final section is an analysis of the impact of recreational boating on the administration of the Rideau Canal and the system as a whole. While it was not Larry’s intention to produce a detailed statistical study, an appendix provides some figures important to his analysis in the text. There is also a large collection of illustrations (87) designed to complement the identification of boats and activities described in the report. Your editor has been working with Robert Passfield on several things and, while researching, made a copy of this manuscript report. With the poor weather this spring, an indoor project of scanning and formatting this document seemed like a good thing to do. So, it became a Book on CD. 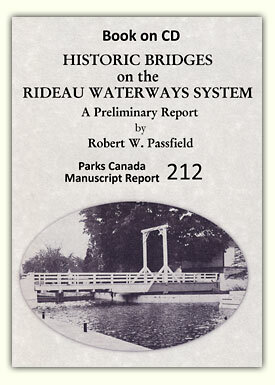 This report locates and identifies bridges of historic interest on the Rideau Canal. The historic bridges are grouped according to their general type (moveable or fixed) and their material(s) of construction. A history and description of each of these structures is given along with a brief history of the bridge site. In 1976, there were 59 bridges on the Rideau - 6 railway bridges: 5 fixed high levels, and 1 bascule; 36 road bridges: 19 fixed high levels, 1 vertical lift, 1 bascule, and 15 swing bridges. In addition, there were 17 bridges at lock stations which spanned either the river or the waste weir channel. Twenty-six of the bridges are briefly described in this 129 page report. There are four manuscript reports being worked on at this time. We have FoR volunteers working on “Commercial Navigation on the Rideau Canal,” “Industries and Industrialists of Merrickville” and “The Second Tay Canal.” Ken Watson planned to do Robert Passfield’s “Lock Design and Construction, the Rideau Canal Experience, 1826-1982” as a project this coming winter. But to get a leg-up on that project, he asked Ellen Manchee if the original images for that document could be located so that he could do high resolution scanning. Unfortunately this document was done by the old Publications Division of Parks Canada, which was dissolved in the 1990s, so the original images could not immediately be found. Ken then asked Bob Passfield if he might have kept copies of the original images. The answer was no, but that started a domino effect as Bob became the project’s biggest booster. In an email Bob said “I put a lot of thought, knowledge and work into it [the report], and have always regretted that it is all but inaccessible to the public.” That in a nutshell is one of the reasons we’re digitizing these reports – to make this valuable research easily available to the public. Long story short with Bob – not only did he manage to locate about half of the images in Parks HQ, he convinced them to scan them in high resolution and at the same time had them OCR the report. Such keenness is infectious, and so Ken has been working with the OCRed report (proofing and re-formating) this summer as Bob continues to source more of the original images (including some in the Rideau Canal engineering office in Smiths Falls which Ken, with the help of Bob, digitally photographed a few weeks ago). So, that report is coming along and should be out before Christmas. There are many other reports still to do – anyone interested in taking one on (to scan and proof) this winter should contact Ken via Friends (info@rideaufriends.com) and he will send you a list of available reports. Due to popular demand, Friends of the Rideau has re-published Ed Bebee’s book “Fish Tales: The Lure and the Lore of the Rideau.” The first publication of this book sold out last year and since then there has been much demand to see it in print again. So this summer Friends republished it and it has been selling well ever since. The following snippet is from my "book in progress" called The Invisible Army. It takes a look at the other heritage and cultural part of the Rideau Canal - the life of the lock staff and other workers who kept the canal together for the past 175+ years. It isn't a collection of "good ole boys" stories and apocryphal tales, but is rooted in as much hard fact as I could find in the dusty files and journals and microfilms. I've tried to present a balanced view of the canal society, but looking at the people as well as the "sticks and stones." Like my previous books, I will "name names", with as accurate a list of names of those who worked at the various stations as I can compile. Sure, there are gaps in the old records, and I haven't tried to get it right up to date. So, I'm always open to new, factual information - send me an email at info@rideaufriends.com. When will it be out? Dunno - all my forecasts have been wrong so far - for sure, it will be in print and available next spring - sooner, if possible - Ed. In a move to enhance the safety of night navigation on some of the more challenging stretches of the Rideau, it was decided to place lanterns at each channel marker. For example, the lockmasters at Chaffey’s Lock were paid extra to ensure that the lanterns were kept full of coal oil and were lit every evening. Naturally the Department supplied the lanterns and fuel. The globes were red and white – “red right returning.” A more difficult stretch to maintain was the canal from Smiths Falls to Merrickville. Byron McCaw had the contract to maintain this part of the river. It is a winding section, especially the Eight Mile Reach from Merrickville to Kilmarnock. Initially McCaw also had to install the tripods that the lanterns hung from. Into the bush he went and cut long poles to make the tripod – one pole longer than the others to hang the lantern. The Department decided to move to floating rafts, with a small tripod mounted on the raft and the lantern suspended from the tripod. Naturally this contract entailed some work. According to Arthur McCaw who accompanied his father, the government would complain if one or more of the lanterns went out during the night. While the basic technology was sound, there were some bugs in it. In June, swarms of small flies were attracted to the light. Sometime the numbers were so great that the air flow to the light would be blocked and the light would go out. Other than that, it was a simple matter to judge how much coal oil was needed to burn until daylight. McCaw would have to clean the flies off each lamp in the late afternoon, wash the globe, and fill the lantern with a measured amount of oil. Arthur thought that his dad might have had as many as fifty to sixty lights in all. Every afternoon about four o’clock, McCaw would leave the farm, start out at Merrickville and work his way up to Smiths Falls. The starting time wasn’t too important, as long as he could get all the lanterns lit before dark. Coming back, the channel was all lit up. Young Arthur recalled coming back trailing the Rideau King or the Rideau Queen. 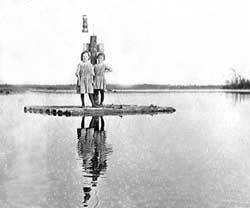 The picture on this page shows the McCaw girls standing on a raft – Blanche (left) and Gladys (right) – 1912. Byron McCaw had a small boat with a single cylinder Toronto Junction inboard engine to power it. Arthur thought it was the only gasoline-powered boat around there at the time. Boys ran down to the river to watch them go by. Byron made his last run in the 1913 season. For the next year, Byron decided that he needed a bigger boat. On one of his return runs to Merrickville, he had been caught in a severe windstorm – some said that it had been a tornado – at Gemmell’s Point – he was lucky to escape. Byron bought an eighteen foot craft with a diesel engine, and then lost the contract for 1914. He had to return his new boat, but this wasn’t too great a loss, because the war stopped all that anyway. The propeller and the steering wheel from Byron’s boat are now on display in the Merrickville Blockhouse Museum. We know that today all the lock gates are painted grey, but was this always the case? During the ICOMOS (a UNESCO technical group) inspection of the Rideau Canal prior to being awarded World Heritage Status, the inspector, Michel Cotte, while visiting Jones Falls asked “were the lock gates always painted grey?” I shall leave out the names of the Parks Canada staff who had the same blank a look on their faces as I did on mine. I struggled to visualize early Thomas Burrowes’ paintings. The gates weren’t grey – but were they unpainted or painted in a different colour? The collective wisdom of the assembled was unable to provide an answer to Mr. Cotte. Painting a Gate This gate was removed while its support was repaired. Lock staff took this opportunity to repaint the gate with a fresh coat of Stone Grey, the colour of all the gates today. If asked that question today, I could provide an exact answer – thanks to a read of Robert Passfield’s manuscript report “Lock Design and Construction, The Rideau Canal Experience, 1826-1982.” There is a whole section devoted to how the gates were painted. And the answer is: Spanish Brown. Spanish Brown was a colouring agent used in the paint for the oak lock gates. During the building of the Rideau Canal, the British military used three main colouring agents; white lead (grey), lampjack (black) and Spanish Brown (brown). The wood for the gates was locally sawn oak. These timbers would have been sanded down to remove any roughness. Metal work attached to the wood of the gate would have been sealed with a thick coat of white lead mixed with linseed oil. Putty was used to seal countersunk holes. Although not noted in the records, knots in the wood would likely have been burned out with lime and then filled with "size knotting", a mixture of red and white lead. With everything in place on the gate they could be primed. This was done with a very thin coat of linseed oil mixed with Spanish Brown. This mixture was repeatedly applied until the wood was saturated with the primer. Once primed, the gate was ready for painting. The paint consisted of linseed oil, white lead, litharge (a drying agent) and Spanish Brown (as the colouring agent). The military convention was to apply 3 coats of paint and this was presumably done for the lock gates. The decision to change the colour from Spanish Brown to Stone Grey was taken in the mid-1800s, perhaps in about 1856 when the British military handed over the Rideau Canal to the Board of Works of Upper and Lower Canada. Specifications in 1861 show that the gates were to be painted with three coats of white lead paint, with the last coat a stone colour. The change would have been gradual since the Board of Works at that time ordered that only expenditures “absolutely necessary to maintain the navigation" be done. So, it is supposed that the painting of gates with Stone Grey would only have been done when new gates were installed (about 5 pair per year). By the late 1800s, it appeared to be a regular spring routine to paint the gates, and all the gates would have been Stone Grey, just as they are today. Parks Canada is hosting a forum with the title “Rideau Corridor, Forum for the Future” It will be held on November 10 at the Strathmere Country Resort in North Gower. As of this writing, that’s all we know. The agenda has not been released to the public. Friends of the Rideau is a volunteer, non-profit organization, working in co-operation with Parks Canada to enhance and conserve the heritage and charm of the Rideau Corridor. For more information contact: Friends of the Rideau, 1 Jasper Avenue, Smith Falls, Ontario K7A 4B5 – Tel: 613-283-5810 Fax: 613-283-2884 – Email: info@rideaufriends.com – Website: www.rideaufriends.com.